This is definitely the era of Disney for Blu-ray owners and this company have released some amazing films of late such as the classic Fantasia to the soon to be released Tangled that once again proves why this company has lasted so long. Now its the turn for the adorable Bambi to come to Blu-ray and this 1942 film can now be experienced on the definitive format, thanks to an amazing restoration process of Disney studios. Bambi was the 5th animated featured to be released by Disney and was based on the book Bambi: A life in the Woods that follows the life of a Bambi (Hardie Albright & Donnie Dunagan), a young fawn who has been destined to become the prince of the forest. From his mother, he learns how to survive in the forest and thankfully our little fawn has a variety of forest friends to help in his journey which is a pure treat to watch. It's also fun seeing the bashful Bambi grow into a powerful young deer, including his friends. There are a few scary scenes in the movie and it should be noted that Bambi was created in a time where political correctness did not exist but for a film that is around 70-years old, I was surprised at how well it dated. 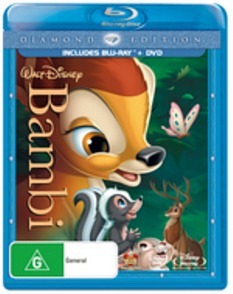 On Blu-ray, Bambi is like a painting come to life as we follow this young Deer as he learns to fend from other animals and human hunters but through the powerful of friendship and family, our little deer excels. Other highlights of Bambi include the colourful characters that such as Thumper (Peter Behn & Sam Edwards), a mischievous rabbit and Flower (Stan Alexander & Time Davis), a skunk who is also learning his role in the forest. Together, they highlight the importance of friendship and that the world they live in is not a very safe place at times but the righteous always prevail. In Bambi, we see action, adventure, drama and a healthy amount of comedy that is still one of the best animated movies of all time not to mention the magical soundtrack. A true classic from start to finish! Compared to the digitally restored Fantasia, Bambi in our eyes is far superior and the digital restoration of this film is truly breathtaking that not only removes the flaws from this older technology but really brings the film and characters to life. Presented in 1080p AVC-encoded image, the transfer to Blu-ray will boast larger than life colours, sharp images and deep blacks. It also highlights that the fact that this film was created exclusively by pencils, inks and paints in a time where computer technology did not exist but the end result still shames a few modern releases. In our viewing, we did not notice any errors whatsoever. In terms of audio, Bambi supports a powerful DTS-HD soundtrack that sounds crystal clear on our 7.1 system. The soundtrack of Frank Churchill and Edward Plumb truly comes alive as do the voices of these animal critters but where this release does shine, apart from the endearing story is through its special features. For special features, Bambi contains a wealth of informative titbits for the viewer that are actually quite interesting and entertaining to watch. My favourite feature was "The Making of Bambi" which goes into some detail on how this movie was created, including all facets of its creation. However "Bambi: Inside Walt's Story Meetings" is one of the cleverest features that I have seen on a Blu-ray release that includes a PIP feature of Walt Disney and those involved with Bambi of how they created the movie. Seeing the archived footage is truly a very memorable experience because this was history in the making. From deleted scenes to original trailers and even production tricks of the time, there's even interactive galleries and a great featurette for kids called "Disney's Big Book of Knowledge" that allows children to take a tour of the world of Bambi. With many more special features, Disney once again provides great buck for your money. Bambi is definitely a classic Disney film and even 70 years later, this label still remains. The digital restoration of this movie must seen to be believed because even though it looks amazing on Blu-ray, it does not hamper the hand drawn animation whatsoever. Interesting enough, the story of Bambi is actually not that clichéd as many movies of today as it focused more on real-world dangers of the forest animals. For Disney fans or those who enjoy a good movie, we could happily recommend Bambi to everyone on Blu-ray. For your chance to win a copy of Bambi 1 or 2 on Blu-ray, click here!